I knew that in general the higher the resolution that an image has, whether from a digital camera or a scanner, that the image would appear more clean and less jagged. From experience, I also knew that the the closer the dots in an image are, the more likely I was to not notice that they were dots at all. At some point, if the dots are close enough together, somehow my eyes would just blur everything together and the image I wanted would look great. Typically, I would end up scanning a picture in at a bunch of different resolutions and printing them off a bunch of ways before figuring out what resolution was best. Because I didn't know if making them look good depended on the picture I was making or my own eyes. I typically ended up going through this process a lot. The resolution always ended up in the 200-300 dpi range, and that seemed to be the same as most of the suggestions for printed resolution that could find. However, there were enough suggestions to print at 600 dpi or higher that I never knew what was best. It turns out that the human eye only has a certain number of light detectors in it. The retina of your eye, where anything you look at is projected and converted into a signal to send the brain, only has a limited number of sensors, called Cones & Rods. It is these sensors that convert the light that enters your eye into nerve impulses for your brain to figure out. Since these sensors are in limited number, it makes sense that they can only handle a certain amount of information. When they have taken in all they can, your brain goes to work and interprets the signals from the sensors, and also determines what is likely to be between the sensors as well. It is for this reason that after a certain number of dots are printed that everything blurs together and the images appear clean. So the question was, how much information is necessary, before my brain makes everything look good. The good news is that a lot of hard working scientists in the field of vision have already figured out how much information a human eye can handle. However, it appears as if they have left it to me to determine how that relates to digital images. So I did. Your eye takes in light in the shape of an ever increasing cone that gets larger as the subject you are viewing gets farther away. The smallest part of the cone is on the retina in the back of your eye, where the light is focused. The size of the peak of the cone does not change much, and your eye is constantly working to focus the light on this area. In this area, your eyes have a densely packed bunch of sensors, that make up your central field of vision. This area is called the "fovea". Since the size of the circle of light changes very little, and there are only a fixed number of sensors in this area, your brain must determine how to blend what you look at together. The further away something is, the smaller the area it will cover at the end of the cone where it is located. This translates back to an even smaller area at the retina. Therefore, when an object is viewed up-close, your eye's central field of vision is filled with the object and a lot of information about it is sent to the brain, and the detail of the object can be recognized. As you move away from the object, it covers less of your central field of vision, and therefore less information about it is sent to the brain which results in the detail of the object being reduced. As you move away, eventually, it will cover such a small portion of your central field of vision that virtually no detail at all can be seen, but your brain does a lot of work and still interprets what you see as best it can. This is all very good for those of us who enjoy digital images, as they are completely made up of a bunch of dots that our brain needs to blur together so we can see one smooth image. The point at which the dots blur together, is determined by the number of sensors stimulated by light. For the best possible case of lighting and contrast (bright lighting, 100% contrast [black vs. white]). 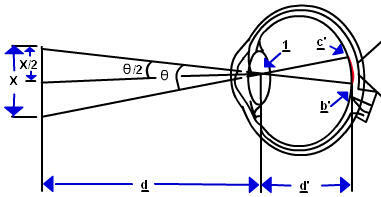 This can be measured by the angle of the cone that is formed from your retina to the image you are viewing. The angle is determined by the height of the object and its distance from you, and is typically measure in "degrees" (Θ -theta in the figure above). Scientist and doctors measure your ability to recognize a certain amount of detail for each single degree of your viewing field. I am sure that you have heard the term 20/20 vision which means that you are able to recognize at 20 feet what the average person with good eyesight can recognize at 20 feet. This also happens to relate to the minimum size of an object that you are able to recognize from the rest of an image before it is blurred together into one image. This is called "Visual Acuity". To understand how this is measured, you must know how angles are measure form a circle. A circle is divided into 360 "degrees". Each one of these degrees can be divided into smaller units called "minutes". There are 60 "minutes" in every "degree". Visual Acuity for an individual with 20/20 vision is measured as the minimum angle of their viewing field that must be filled with an image to recognize one feature from the rest of the image (measured in "minutes"), 20 / 20 = 1 "minute". A person with 20/10 vision can recognize one feature from the rest of an image at 20 feet when the average person has to be at 10 feet to recognize the same detail. The 20/10 person also only has to fill 10 / 20 = .5 "minutes" of their field of vision to see that level of detail. A person with 20/200 vision has to be 20 feet away to recognize one feature from the rest of an image, when the average person can recognize this from 200 feet away. This person also has to fill 200 / 20 = 10 "minutes" of their field of vision to recognize that level of detail, not very good. The greatest possible resolution for a person's vision is determined by the total number of sensor on the retina, per "degree" of their field of vision. Every "degree" of a field of vision (60 minutes) results in approximately 288 micrometers of light that is projected on the retina from your eye's lens. The average human eye contains approximately 120 Cones in this same area. This can differ depending on the person. Since there are only 120 sensors, no more than 120 pieces of information can be determined for each "degree" before your brain blurs things together. Any more information delivered to the retina and there are no sensors available to send it to the brain. That means that if you line up a number of dots alternating in color between black and white, that only 120 of these can be viewed per "degree" of vision and still be seen as individual dots. Any more dots in this "degree", and your eye will blur all those black and white dots together into a shade of gray. The person with this level of perfect vision would be classified with 20/10 vision, 10 / 20 =.5 "minutes" to recognize 1 feature from the rest of an image. If there is one one recognizable feature, it must be recognizable from another contrasting feature in the image. Therefore, there are 2 features per "minute", .5 "minutes" for each white and black. So, in one "degree" there are 120 features that can be recognized (2 features x 60 minutes = 120 features). To relate this to a line of black and white dots, there would be 60 black dots and 60 white dots. That is the maximum that a person with ultimate vision could ever see. The average person with 20/20 vision can only recognize 60 features (20 / 20 = 1 "minute", 1 feature per minute is equal to 60 features per "degree" 1 x 60 = 60). Now, that we know the maximum resolution of the eye per "degree" all we need to do is figure out how these "degrees" translate into the actual size of objects in your viewing field. Let's face it, you don't hear many people saying that an object covers 37 "minutes" of their field of vision when asked how tall something is. All of the measurement that are mentioned above relate to the absolute distance between two features. The best way to think about this is the distance between the center of a circle and its ring. No matter which point on the circle we measure from the center, it is always the same. However, in digital images, the pixels or dots are square. The distance from the center of a square to every point on its edge it not the same. The shortest distance is to the flat edges, and the longest distance is to the corners. When we figure out the maximum distance between dots, we must measure from corner-to-corner, which is the greatest distance between objects in a pattern filed with black and white squares. However, picture resolution is not measured on the diagonal. It is measured in the horizontal and vertical directions. Therefore, we have to translate the diagonal distance that we calculate into the horizontal and vertical directions. The result will be that the distance between the flat edges of the squares (horizontal & vertical) will be closer than the maximum distance needed to blur the dots. The max distance plus the size of the dot itself make up one "dot pair" that cannot be recognized as individual dots from a chain of these dot pairs. Below is a chart for the minimum needed resolution of your image (dpi) for various levels of vision and distance from the retina. Personally, moving an image closer than about 8" from my eye tends to only make the image out of focus. So in general, I don't consider the results for any distance less than 8" to be important. To make sure that everyone sees the image as clean as me, I keep my images closer to the 20/15 level of vision. If Superman comes along with 20/10, he will just have to suffer with seeing the dots in my pictures. the resolutions above will be more than enough to blur the dots. To check these numbers I created a few print tests of a field of black dots (1 pixel wide) on a white background for a number of different resolutions. I set my laser printer to print out at 600 dpi, so that it would not blur the dots together for me at the typical setting of 300 dpi. Printing out the test image set to 600 dpi resulted in what looked like a solid gray bar. According to the charts, that is what should happen. The highest resolution it says I would need, even if I have 20/15 vision, is 540. So the calculations and the scientists appear to be right. However, I wanted to make sure my printer actually printed those tiny dots that I couldn't see, and that this gray bar wasn't created by my printer. So, I got a magnifying glass, and a really bright light, and what did I see? A lot of really tiny dots, just as I had created in the picture. The dots were really hard to see even with the magnifying glass and really bright lighting. So it was my brain, blurring the dots and not my printer. Good news. I then printed off a couple of more resolutions. At 400 dpi, I could just very barely start to see a hint of dots at about 8", but once again the magnifying glass showed them prominently, but I could definitely only see a gray bar at 12". At 300 dpi, I could clearly see the dots at about 8", lost them at about 10.5" and at 12" they were definitely gone and only a gray bar could be seen. I must have vision somewhere 20/20 and 20/15 according to the chart. If you want to try this yourself, you can download the images yourself. Print Test: (Print Test 600, 300, 150 dpi, Print Test 400, 200, 100 dpi). Download the pictures by right clicking on the link and selecting "save link as" or "save target as". Then print them out using photo editing software. Remember to make sure your printer can print off at 600dpi quality. There you have it, it appears as if 300 dpi is more than enough resolution for any reasonable person to print their pictures, as the dots could only be seen under the best conditions and by people with the best vision. If you have any questions please feel free to email me at: johnatblahadotnet. Now that takes us to another question, when I buy a digital camera, how many megapixels do I have to have to print off good pictures? If you didn't read the section on the differences in creating and editing pictures for screen viewing and printing, you can read that now.